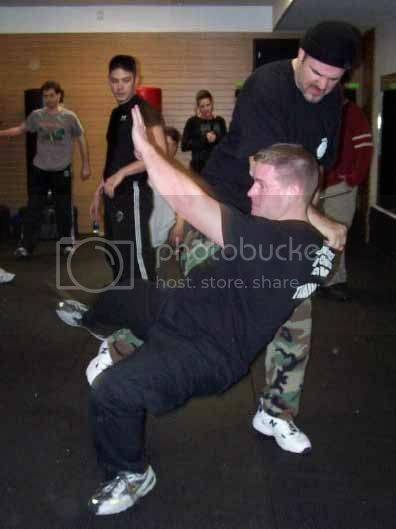 For the nineteen years that I have studied the Martial Arts, my primary training has been in a street orientated style, taught by Bobby Jones, a former night club bouncer/minder in Australia; the fact that he now has over 300 schools throughout the country is positive proof that he's doing something right! Because of this 'realistic' upbringing I admit that I've done my share of 'slagging off' Judo as a pretty ineffective system of self-defence. Recently however I've had my eyes opened by our cousins on the mats to such an extent that I was prompted to write this article. Lets start with a little scenario which is 'make-believe' but not too far-fetched at all, in my opinion. Imagine, you're standing at the bar of your local 'watering-hole', having a well-earned drink, after a hard session in the dojo/kwoon/gym, when two idiots next to you take offence to your face and decide to rearrange it. They start insulting you, loudly, and before you can down your beer and go elsewhere they begin jeering, pushing and shoving. You do the right thing and try and talk your way out of it but they mistake kindness for weakness and figure you'll be a pushover. All of a sudden the one on the right 'takes off' on you, knocking over a table load of drinks in the process, his right hand is back and his glass is in it, lunging at your face. You've got three years of training under your belt and everything seems to be moving in slow motion. You're right side on to him, as his arm nears you block it with your right forearm and, without I pausing, you snap a backfist across the bridge of his nose. There's a satisfying “splat” as it bursts, and a great spray of crimson covers the front of his shirt. Without slowing you lean back and slam a sidekick into his sternum, blasting him back across the room and already you’re looking for his partner. You'd hoped his mate would be impressed with your impromptu display of Martial Arts prowess and turn tail and run. But not this guy. He's a seasoned streetfighter, been in hundreds of them, and he’s already got you figured, knows he can't possibly win toe-to-toe swapping punches, so he takes the only course left and runs in to tackle you to the floor where he assumes at least you'll be on equal footing. You see it coming a mile off, this one's going to be easy, you drop back slightly, time it just right, and then fire off a near perfect front kick but 'sods law' is at work: you're wearing tight jeans, leather soled shoes and are standing on beer-sodden carpet tiles and, instead of stopping him in his tracks with the kick, you're on your arse with a vicious, streetwise scumbag on top of .you, pummeling your face. You've never been hit like this before! Oh sure, the occasional bloody nose or split lip in the dojo but when that happened someone stopped the fight and ran over to make sure you were 0K. Now all of a sudden you're on your own. No-one is going to stop this. Adrenalin is coursing through you, panic is starting to set in and all your training is going right out the window. 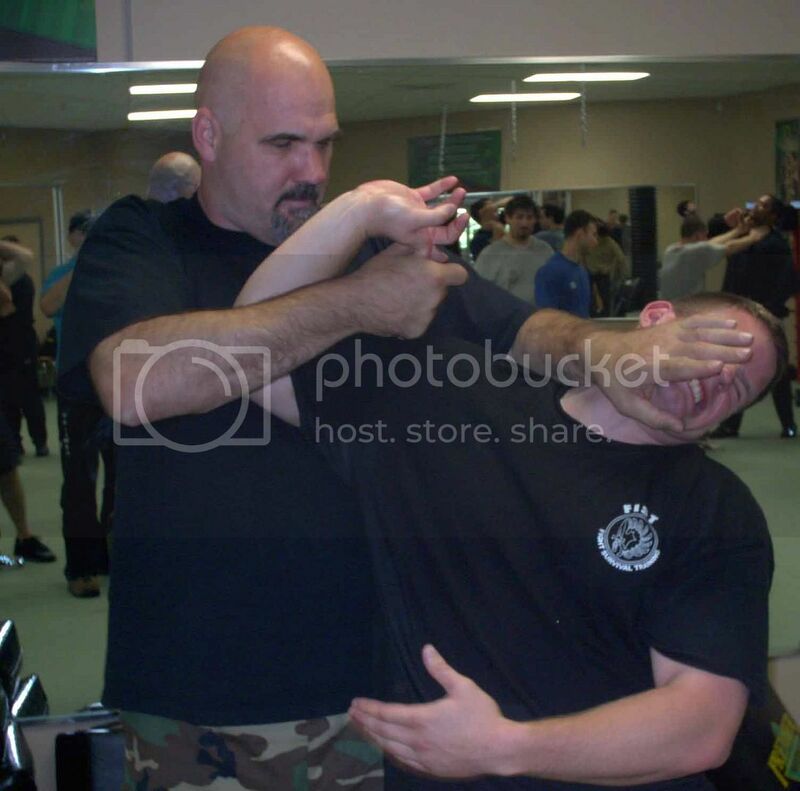 Somewhere though, deep in your subconscious, you recall an article in your favourite martial arts magazine about a certain Gary Spiers and how he used to bite, gouge and spit in situations just like this. So you reach up, grab a handful of the jerk's hair and haul him in tight while burying your thumb up to the hilt in his eye socket. He must know this is a good technique because he's doing it right back to you, your hair is being reefed out in clumps and he keeps clawing for your eyes! Fortunately for you, superior fitness takes over, his diet of lager and pork pies is no match for your five days a week in the gym and home cooked meals, and so you're able to roll him off the top, gather your money off the bar and with the little pride you've got left, get the hell out of there, licking your wounds. Now, unless you are none too smart, you'll analyse the fight, and figure out what went wrong, and what steps you can take to make sure it doesn't happen again. The obvious solution would be to get yourself along to Judo or Wrestling classes lf you'd done that beforehand you'd have been able to tie-up, strangle, or arm lock your adversary a whole lot quicker, without marking him (consider the legal angle ladies and gentlemen! ), and, even if he'd thought your moves were good there'd be no way he could duplicate them. Consider also what may have occurred if there'd been four aggressors instead of just two, you'd have been on your feet a heck of a lot quicker to deal with number three and number four, instead of rolling around the deck, with your head, ribs, groin etc. getting the 'Football treatment'. OK, I'll admit that judo has some weak points: firstly it's a sport in which many of the most effective (read 'dangerous') techniques of its 'mother art', ju-jitsu, have been outlawed. (Although they are taught later on as part of the black belt curriculum). You do have to grapple with an adversary which can be suicidal if he's got an edged weapon. Finally, most of the techniques require the use of a jacket which imposes certain limitations. However, all of the above are negatives, let's look for a moment at the positive aspects, which, I'm sure you'll agree, far outweigh the negatives. For starters, you learn the ability to fall without hurting yourself which in itself, without the throws, armlocks and strangles, is an art worth mastering. I've avoided several lengthy, painful and expensive stays in hospital when coming off my motorcycle due to my ability to tuck up and roll as opposed to a man's natural reflex to stiffen and throw out your arms to take the brunt of the fall. Simply put, every Martial Artist, regardless of the style he studies, should be able to survive a body/ground interface. Next point to consider: in judo, as in Wrestling, the training is for real! No other styles really train like that! In Karate and Kung Fu we pull our techniques: in Boxing, Muay Thai and other contact sports we wear protective gear such as gloves and groin guards. In judo and Wrestling on the other hand, we go all out trying to throw an opponent who'll be doing his utmost to throw us. Think then, if I can still successfully throw an opponent who knows what I'm likely to try and has superb balance -as a result of years avoiding such throws - then how easy is it going to be in a street situation? In that sort of conflict I'm dealing with an adversary whose normal (un-trained) balance will possibly be impaired by alcohol consumption; an adversary who doesn't know what I'm likely to try next, whose descent I'm not going to control, who doesn't know how to fall safely and who doesn't have any mats to land on anyway. Can you imagine that? Slammed into a cold, hard, pavement from six foot in the air, and, while his brain is trying to decide which is the more painful -the lack of air in his lungs or his broken collar bone, he is suddenly landed on by the full I weight of the guy who just flattened I him OUCH!! because all year round we wear, tee-shirts and, it is fairly disconcerting, when you end up hurling a tee-shirt into the floor instead of the one who was wearing it!. Here in shivering Europe though, for at least nine months of the, year, everybody wears sturdy jackets of leather, suede or denim. What more could you want? Besides, most judokas' .are cross -training now in Wrestling, and Sambo (and vice -versa) so they're picking up a whole gamut of techniques that doesn't require a jacket to be effective. Lets also take into account that a great) deal of street fights end up with the participants grappling on the floor. Here, the judoka is in his element! It was a famous Japanese Karate Master who warned all his students that the most dangerous adversary for a Karateka is a Wrestler/judoka. If you miss with that punch or kick and they get a hold of you then lets face it, you're history! In Amsterdam, where they regularly arrange matches between judoka, Boxers, a Wrestler and Karateka/Kung –Fu stylists etc it's invariably the grapplers that win! Curtis Sliwa, founder of America's ~I famous 'Guardian Angels', puts it on the line more often than most and his background is Judo. The first fight he ever had -and in fact it was this incident which prompted him to start the Angels -was in a cafe with a gang of thugs who were hassling the proprietor. Curtis grappled with the gang leader and ended up throwing him through the storefront window, and the rest of the gang, being true to form, saw this and fled. Someone else who swears by the efficacy of Judo is the former head (now retired) of Marseilles' famous 'Brigade Anti -Gang' or, the 'Groupement d'lntervention de la Police Nationale' one Commandant Ngyen. Commandant Ngyen is a legend in his own time and has been featured in numerous press articles, most recently the infamous American Publication, 'Soldier of Fortune'. I heard about this famous Marseille ‘flic’ whilst serving as a Military Policeman in the French Foreign Legion, and was somewhat surprised to hear that Judo was their unarmed combat technique. (I was stationed in Marseille and can testify to the city’s "heavy" reputation). Nygen admitted, in one of his interviews, that Judo was one of their most oft -used skills: when you slam a perpetrator into the bitumen they usually don't get up in a hurry to bother you again. He practised what he preached, and in one of his most renowned exploits, in which he traded places with a hostage during a bank siege, Ngyen overpowered his armed adversary with Judo. Only ten minutes after trading places and going into the bank, Ngyen emerged with the bandit unconscious and handcuffed. Obviously the techniques of Judo aren't going to be of much use in an altercation with a mob. Recently I had a fight with fifteen punks in London (Police witnesses counted fifteen, I only made it about a dozen) and I was hugely; grateful for all my years learning to punch and kick. Judo techniques in that sort of situation would have been about as useful as a handbrake on a canoe. But, in the field of Close Personal Protection where I now work, looking after celebrities and the like, Judo is a godsend. Now, instead of punching some overzealous autograph hunter, or paparazzi, and being photographed doing it, I can use a discreet sweep, standing armlock, or strangle to remove the problem, and leave no marks upon him. In my job the ability, to remove a troublemaker, quietly, quickly and above all, without bloodshed, is extremely valuable.